Y54U is a personal wireless modem that connects any WiFi-enabled devices to the internet with a secure network connection. Think of the WiFi you have at home, just smaller, in a pocket size version. You can connect your laptop, tablet and (or) mobile phone to the internet while you are travelling overseas, anytime, anywhere. It saves you from costly data roaming, WiFi hunting and loads of prepaid SIM card credits. Y54U is pre-configured and does not require any complex installation. TOTALLY & TRULY UNLIMITED No data limits or caps: non-stop Internet access encouraged. 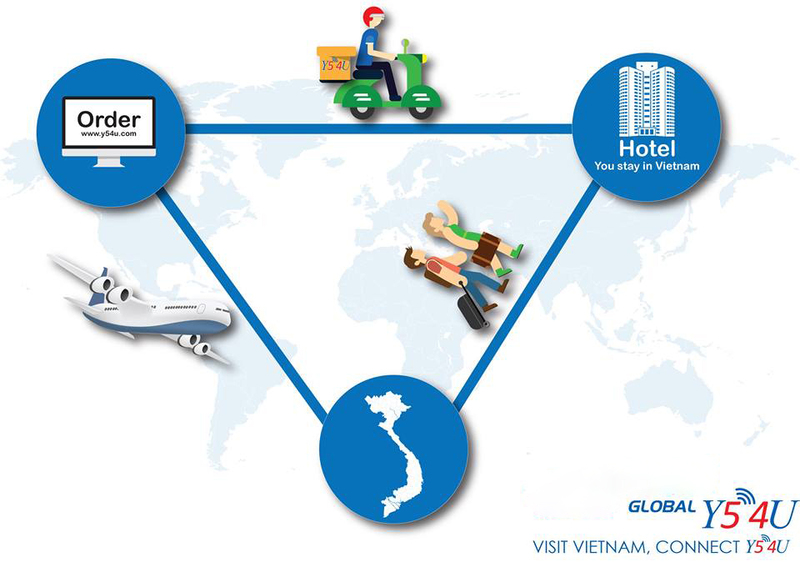 EASY DELIVERY & RETURN Receive anywhere in Vietnam (even airports), and return via self-addressed envelope provided. You can drop off at your hotel front desk, before going home. NO MORE ROAMINGAvoid expensive roaming charges the smart way. 24/7 CUSTOMER SUPPORTGet in touch anytime via phone, email, chat, social media, WhatsApp, Wechat, LINE or apps & any VoIP services. CONNECTIVITY Connect up to 5 devices.